Last week on the N.C. Cooperative Extension Horticulture Agents listserv, there was a discussion about homemade fungicides and whether extension agents should recommend them or not. The infamous “Cornell Formula” fungicide was mentioned as an example. If you Google “Cornell formula fungicide” thousands of results are presented. Many of these tell you how to mix up and use this miracle fungicide that was, they claim, developed by Dr. Ken Horst, a pathologist at Cornell University. Many of the sites come across as credible sources of information. But look at some of the other results that come up and you will see a discrepency. Many of those results start out with “Dispelling the Myth of the Cornell Formula Fungicide”. Those explain that there really is no “Cornell Formula” fungicide and that information on an incomplete experiment was distributed over the Internet and has kind of taken on a life of its own. The bottom line is that the “Cornell Formula” fungicide doesn’t work and can actually damage plants. I have reprinted the press release about that below. And thank you, Gary Pierce, Harnett County Agent, for bringing that press release to our attention. My point here is, there is so much “information” available to us now via the Internet. Anyone can post anything they want to. You don’t have to be an expert to put up a website or blog and start giving out advice. Please take the time to do a little research, dig a little deeper, find out the qualifications of the person/website providing the information, and check their sources. In the case of farming and gardening, most always, the information you get from universities, Cooperative Extension, USDA, and professional organizations is valid. There are also some really excellent personal, small-business websites providing information, too, but amongst them are people with very limited knowledge providing a real mix of fact and fiction. They often have no professional education or training and/or very limited experience in the area they are professing to be an expert on. And I’ve found that some media sources, including radio and television, are also guilty of this. So check that out next time you turn to the internet for advice. If you want to learn how to manage late blight on tomatoes, do you want to get that advice from someone who has a PhD in pathology and has been working on tomato diseases for twenty years or from (and this is just an example that I made up) someone with a MBA, who is an expert in business, but just recently developed a passion for gardening and created a website to share his new found knowledge? By the way, Dr. Ken Horst did go on to get a number of patents for fungicides that are available for home gardeners and commercial growers. Erroneous information has led to the use of ineffective homemade formulas. Ithaca, NY, February 8, 2006 — Inconclusive information that originated out of isolated results from scientific trials has found its way into the public domain where it contributes to the myth that concoctions and mixtures of sodium bicarbonate, oil, water and soap are a recommended “Cornell Formula” fungicide. There is no such formula. Many of these so-called formulas have very limited benefit and some of these recipes can even result in phytotoxicity or burning of the leaves. For example, baking soda and water by itself has limited benefit because it does not spread evenly across the surface of the leaf and easily washes away. The use of oils or soaps to spread and stick the bicarbonate can lead to an unwanted build-up of chemicals, alter soil pH levels and increase the potential of phytotoxicity. For example, many of the formulas that are repeated on websites, in articles and various publications call for the use of dishwashing soap or other detergents. Adding in soaps that are comprised of a laundry list of chemical ingredients may not be wise. Most soaps now have anti-bacterial chemicals such as Triclosan that could kill necessary bacteria in the soil and may be detrimental to nutrient absorption. Accumulation of these chemicals in or on treated vegetables may not be healthy. Many soaps also have degreasing agents and other chemicals that may not be useful or safe when used as a plant spray. Stories about the efficacy of baking soda in controlling garden fungi have circulated for many years. Its use is a welcomed alternative to other fungicides because bicarbonates, both sodium bicarbonate and potassium bicarbonate are recognized as safe food additives and do not have adverse environmental impacts. It’s no wonder that baking soda-based formulas have been so eagerly passed along among ornamental and organic gardeners. In 1985 Dr. Ken Horst began research into the efficacy potential of bicarbonates. The research was intended to quantify the true efficacy of bicarbonates, identify their mode of action and determine the most effective use of these compounds. For these reasons and others, horticultural oil was rejected as a spreader-sticker. In order to find a safer, more efficient additive, more than 350 spreader-sticker systems were evaluated. 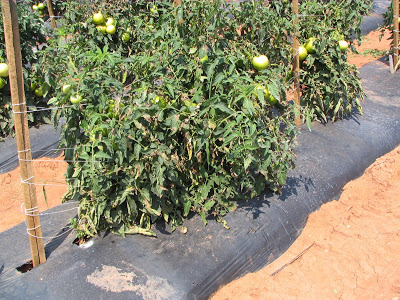 Highly effective spreader-sticker additives were discovered which increased the efficacy and reliability of bicarbonates for use on ornamentals, vegetables and fruits. Additional research was done on a wide variety of plants and quantitative results were determined for a broad spectrum of fungal diseases. Ultimately, a combination of spreader-sticker additives in very specific quantities was found to be significantly more effective than all other alternatives. The patented formula, which is distributed by H & I Agritech, Inc., has been successfully used in commercial and large-scale agricultural settings for nearly 10 years. The same product is also available for use on indoor plants, in home gardens, small organic farming and greenhouse operations under the name GreenCure®. GreenCure® cures and prevents powdery mildew, blackspot, blights, molds and other plant diseases on garden crops & ornamentals. It is labeled for use against more than 25 different plant diseases including Downy Mildew, Powdery Mildew, Alternaria Blight and Blackspot. It is registered for use on over 85 different annual and perennial flowers, woody and ornamental shade trees, woody and herbaceous ornamentals, many herbs and vegetables, and ornamental nut and fruit trees. Prevention and control of plant mildew and related plant diseases is of great interest to gardeners. Fungal related plant diseases are damaging and unsightly in ornamental plants and can outright destroy garden crops. In addition, plant molds and their airborne spores can cause allergies and adverse health effects in humans and animals, therefore control of mildew is a serious concern, but controlling mildew the right way is very important. The active ingredient in GreenCure® is potassium bicarbonate, which is listed by the U.S. Food & Drug Administration (FDA) as generally recognized as safe (GRAS). It is commonly used in foods and medicines and does not have any adverse environmental impacts; therefore the appropriate use of this compound, as a fungicide is an important alternative to many of the conventional fungicides that are undergoing toxicological review by the EPA.